Designing a layout is one of the most enjoyable aspects of model trains. Before you begin building you should spend time designing your layout properly so you don’t run into any problem later on in the building process. Before you begin designing your layout you need to establish the size of the area available to build your layout. Different scales have specific requirements regarding minimum corner radius needed for trains to to operate without derailment and also still appear true to life. Be sure you have enough space available to fit the scale you are using allowing for the corner radius, also allow some room around the edges so your track doesn’t hug the edge of the layout. Once you have established the area in which you are going to build your layout you need to think about the location and time period your railroad will be modelled around. Possible locations include the mountains with lots of trees and logging trains, long straight tracks that pass through the desert , docklands with ships and water, rural country town or a metropolitan train yard. Plans are available for popular and historical rail locations, alternatively you can use Google Maps to study railroad layouts as well as the size and location of buildings and other surrounding structures. Steam – consists of any period between the late 1800’s up until the end of world war II (1940’s). Steam powered locomotives were most commonly used in the 1930’s and 1940’s. Transitional – during the 1940’s and 1950’s there was a transitional period as steam locomotives were replaced with diesel locomotives. Basing your layout during this period allows you to run both types of locomotives so it’s quite a popular period. Modern – from the 1960’s up until the present day. Allows for the running of both classic diesel locomotives, modern diesel locomotives as well as modern electric powered locomotives. Creating a modern layout gives you lots of freedom as to the types of locomotives you run. Elevation – can be as simple as a small incline from the front to the back of your layout or as complex as tracks that wind their way up the side of a mountain. The only consideration that needs to be taken into account when designing elevation is the steepness of the gradient. In the real world tracks generally don’t exceed a gradient of 2% but most model trains are capable of climbing a gradient of 4% depending on how many carriages you are running. Concealment – achieved by running tracks through tunnels or underground areas of your layout. When designed well concealment will create a sense of anticipation as the viewer waits not knowing where the train will emerge from next. Bridges – are used to either cross one track over another or for cosmetic appeal. Bridges are fun to build and can be constructed in a number of different ways using stone, wood or steel. There are many free and paid software programs that allow you to design a layout. These programs are great for playing around with different ideas, once you have settled on a design you can print it out or share with others for feedback. These programs will also generate a shopping list so you know what pieces of track you need to purchase. XTrackCAD (www.xtrkcad.org) – free design software available on Windows, UNIX and MacOSX. XTrackCAD allows you to design layouts in any scale and gauge then test the layout by using simulated trains. SCARM (www.scarm.info) – Simple Computer Aided Railway Modeller is another free program with the added feature of being able to view your layouts in 3D. Unlike XTrackCAD SCARM is on available to WIndows users. AnyRail (www.anyrail.com) – has a free trial download that will allow you to create a design with upto 50 pieces of track, alternatively the full version can be purchased for $59 allowing for unlimited size designs. One of the hardest decisions a newcomer to model trains has to make is what scale layout they are going to build. The Wikipedia page for rail transport modelling lists over 45 different scales which can be rather confusing if you are new to the hobby. With all the various scales available it would be frustrating to purchase a train set only to find that additional parts and accessories in that scale are rare or non-existent. Therefore the popularity of the different scales is something you need to consider when choosing a scale. 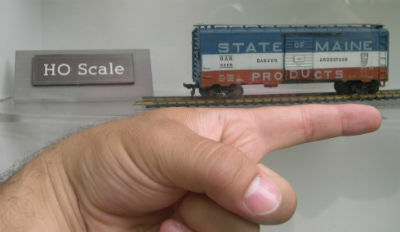 G scale is the largest commonly used scale for trains that would still be considered models and not miniature trains. G scale offers great detail and durability and for that reason they are commonly used in garden railway layouts. O scale is popular amongst hobbyists that like to focus on detail rather than operation. O scale grew in popularity as many childrens toys originally used this scale for its size and durability. There are many people who collect vintage O scale models. HO (OO in Britain) is the most popular scale. There is a large amount of ready to run sets available in HO scale making it a great scale for beginners. HO scale is large enough for you to build detailed custom scenery but does require a decent sized area for the layout. N scale allows you to create decent sized layouts yet still have plenty of space for scenery, the downside is N scale trains are not as detailed as larger scales. The focus for many N scale enthusiasts is to create broad open countryside layouts as opposed to detailed lifelike scenery. Z scale is a micro scale suitable for people who have extremely limited space. Z scale does have some drawbacks, due to their weight trains will struggle to climb gradients over 2%, the size of Z scale also makes them prone to derailments as the smallest obstruction on the track can be hazardous. The scale chosen is often dictated by the amount of space available to build a layout, larger scales squeezed into smaller spaces are never going to be as aesthetically pleasing as a layout built to suit the space available. When you have a limited amount of space you also need to take into account the turning radius of the scale you are using. For example a HO scale train will require around 24” for each curve (more if you are using large carriages or engines) so your bench would need to be at least 48” wide, not taking into account space around the edges. Tight radiuses can lead to train derailments and appear less realistic. Space however is not the only consideration that should be taken into account when selecting a scale. Larger scales allow a modeler to more easily create custom buildings and scenery, if you are interested in creating buildings and scenery from scratch then a larger scale will be better suited to your interests. If there is a particular make of train you are interested in running you should find out what scales it’s available in. Many of the popular train makes are available in multiple scales but if you are interested in a very specific make of train your choice of scale may be limited. Costs of building a layout generally increase as the scale increases. Before choosing a scale factor in the cost of buildings, landscaping and additional trains. Model trains can be an expensive hobby so choose a scale to fit your budget. Remember building a layout is a time consuming process so its worth taking your time and carefully considering all options before starting. It should also be noted that there is no “best” scale, choose the scale that meets your individual requirements and enjoy!